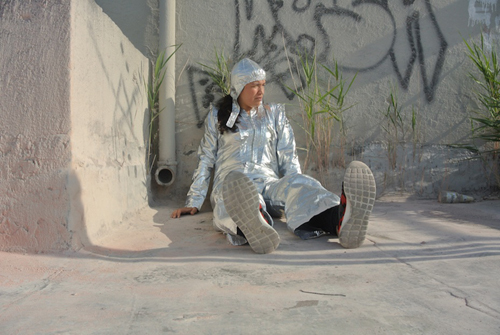 On Sunday October 18 from 12:00 pm on, Maria Hupfield will give a durational live performance, titled In the Making, in which she uses a sequence of action and sustained poses to become reacquainted with, recall old memories, and make new ones to ultimately transfer and exhaust the power of her handmade silver Lady Moonrider suit, one of the objects in the exhibition, over an extended period. She starts when the gallery opens at noon and continues the performance until . . . she is done. This performance aims to retire the suit and marks her last time wearing it before it is laid to rest. The performance ends with her packing the suit and is documented with her time-lapse camera from a fixed location in the gallery. The performance will be open to the public and anyone is free to come and go or stay in the space for as long as desired. The technology of the camera will function as a document to recall the lived and shared memory of the suit in action. This performance is free and open to the public. Maria Hupfield, In the Making.